If the way to a man’s heart is through his stomach, you need to a bring a dozen of these cookies when you meet your potential boyfriend. After some time, once you’ve decided he’s a keeper, you can proceed by serving him engagement chicken to seal the deal. Alex and I started dating 5 years ago. We met in St. Helena (up in Napa Valley) while we were both students at the CIA. We (along with all our other LA bound classmates) flew down together for Thanksgiving break. On our flight back to San Francisco, I brought Alex a dozen of these chocolate peanut butter cookies. He ate most of them on the 90 minute flight and proceed to continue eating the remaining cookies on the 90 minute drive to Napa. Since finishing said cookies, he’s been in love with me ever since. If it worked for me, it can (probably) work for you! The fine print: he must like cookies, peanut butter, chocolate, and baked goods. Although I can’t make any guarantees that you’ll snag a boyfriend, if said boy doesn’t like your homemade, freshly baked cookies- he’s not worth your time. You could use plain old peanut butter, or you can amp it up with chocolate peanut butter. 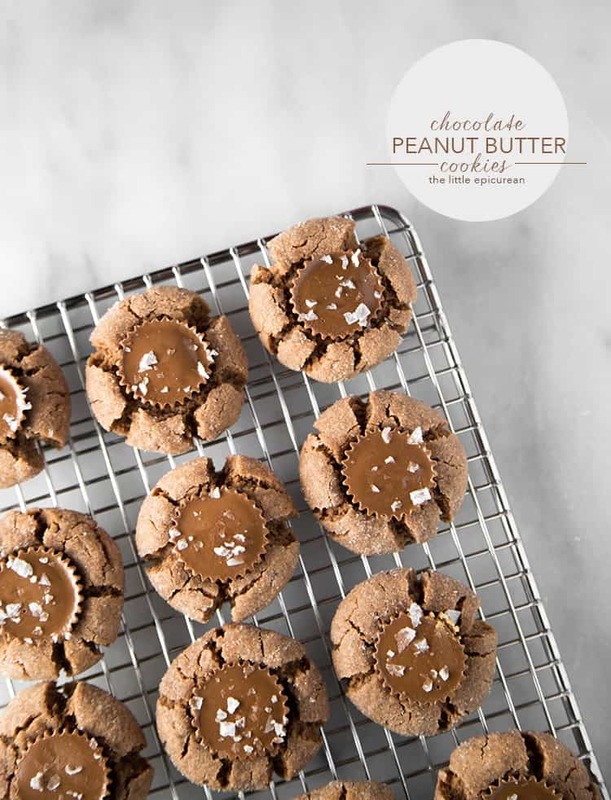 I used my favorite- Dark Chocolate Dreams from Peanut Butter & Co. (Luckily for you, there’s still time to enter my peanut butter giveaway here!) One of these days, I’m going to test this out with almond butter and homemade chocolate almond butter cups. I’m sure it’ll taste fabulous, too. I love these cookies because they’re soft on the inside and just a tad bit crackly and crunchy on the outside. When you eat them straight from the oven (which is the BEST way to eat cookies), they’re heavenly. 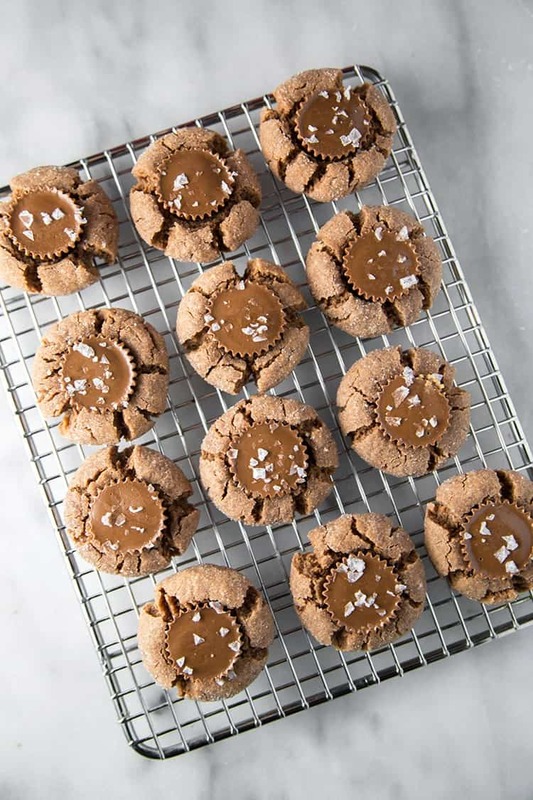 Think about it: warm cookie with almost melted peanut butter encased in silky milk chocolate with a little sprinkle of Maldon sea salt. Yup. I’d definitely fall in love because of these cookies. Hey LA/OC friends! Do you love cookies?! 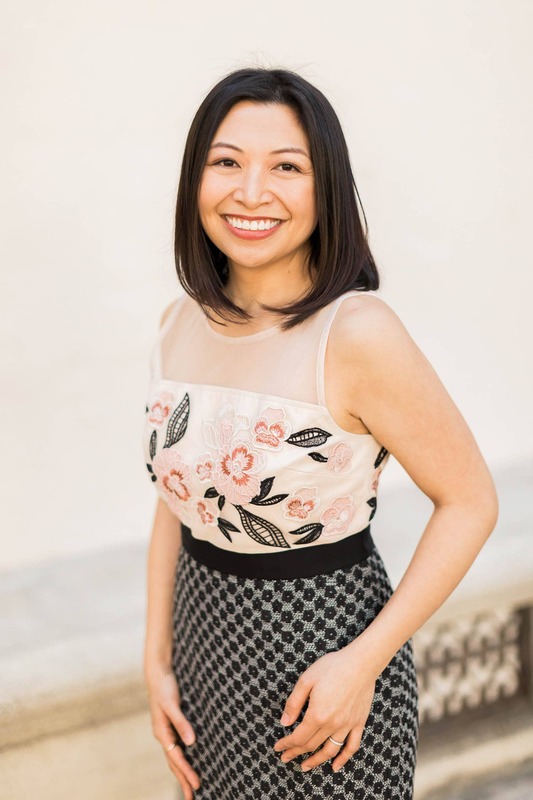 Christine of Feed My Sole, Ellen of In My Red Kitchen, and I are hosting the LA Food Bloggers first annual holiday cookie swap! Come meet other Los Angeles based food bloggers while you eat cookies and get caffeinated at Blacktop Coffee. The cookie swap is this Saturday and you can sign up here. You can't go wrong with chocolate and peanut butter. These cookies are easy to make and sure to please a crowd. Recipe can be easily doubled and tripled and is a great way to use up leftover candies! Preheat oven to 350 degrees F. Line baking sheet with parchment paper. Place unwrapped mini peanut butter cups in the freezer. In a medium bowl, cream together chocolate peanut butter and unsalted butter. Add sugar and beat until combined. Add egg and stir until incorporated. Scrape down bowl as needed to ensure thorough mixing. In a separate bowl, whisk together flour, baking powder, and salt. Add flour mixture to creamed mixture. Fold until incorporated and there are no longer and dry streaks of flour. Portion dough into tablespoons and roll into balls. Coat dough balls in granulated sugar and place on prepared baking sheet, placing balls about 2 inches apart. Bake for 6 minutes. 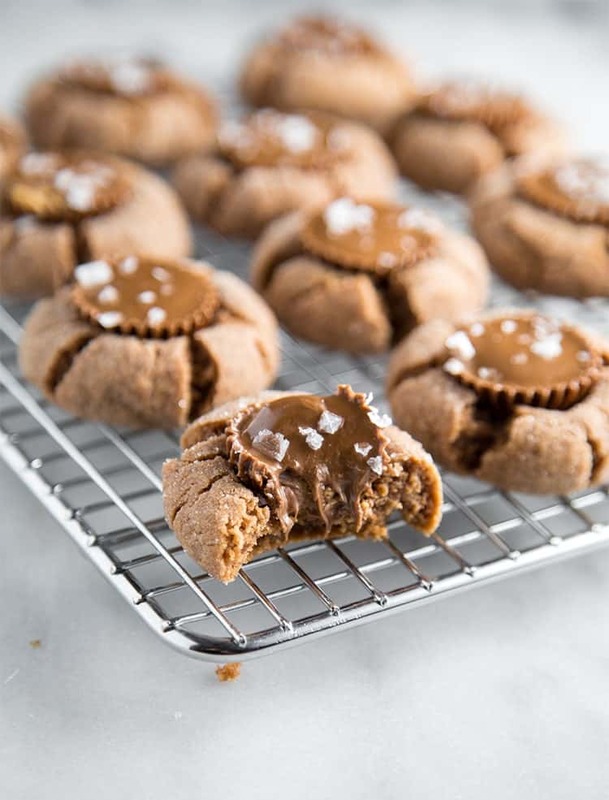 Remove from oven and press one chilled mini peanut butter cup in the center of each cookie. Return to oven and bake for another 6 minutes. Remove from oven and sprinkle each cookie with Maldon sea salt. Let cool on sheet tray for 5-8 minutes before transferring to wire rack to cool completely. Ooooh that bite shot! Pinned before I even commented. Also, the absolutely CUTEST story! My boyfriend and I met in college at our mutual friends’ house after a night of going out. I ended up making everyone macaroni, and he proceeded to ask if I would marry him. Our friends get a kick out of that story and always say that they’re going to tell everyone at our wedding! That bite shot was torture. I had to try really hard not to eat the entire cookie! YAY! I’m excited for the cookie swap! I hope it doesn’t rain! oh May: your recipes are incredible and delicious!!!!! I love this – you’re right, if he doesn’t like your cookies, it’s never going to work. (PS. I started reading this post and thought you were about to tell us you were engaged…I AM ON THE EDGE OF MY SEAT, ALEX. No pressure). 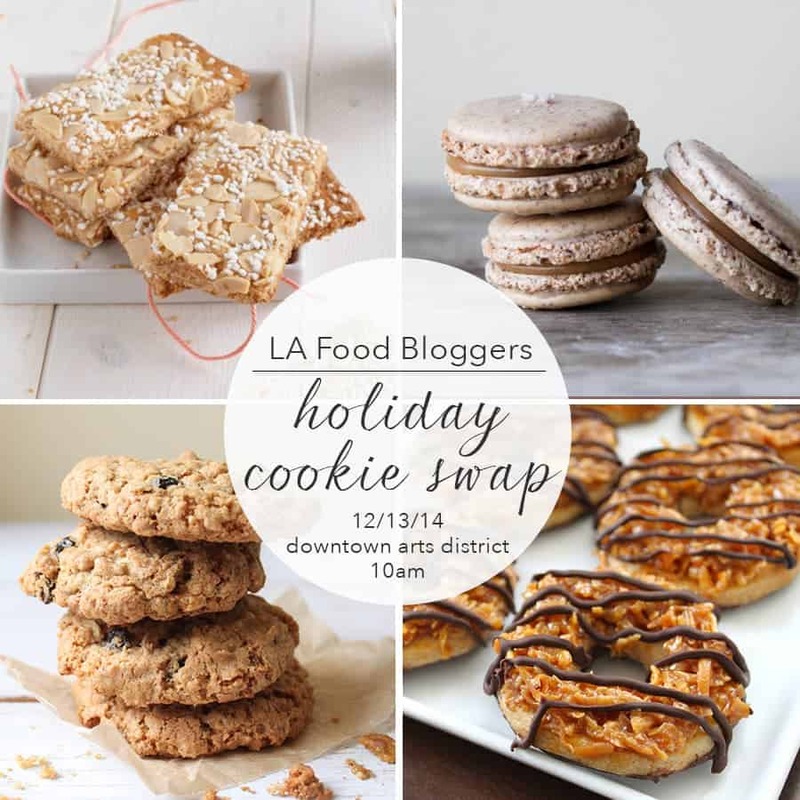 I’m so jealous of your LA food blogger cookie swap – eat a dozen just for me, please? Not liking my cooking/baking is a giant red flag. HAHA, I’m still waiting to hear the question and also still pondering my response.